SACRAMENTO, Calif. - Amid severe drought conditions, California officials announced Friday that they would not send any water from the state's vast reservoir system to local agencies beginning this spring, an unprecedented move that affects drinking water supplies for 25 million people and irrigation for 1 million acres of farmland. The announcement marks the first time in the 54-year history of the State Water Project that such an action has been taken, but it does not mean that every farm field will turn to dust and every city tap will run dry. The 29 agencies that draw from the state's water-delivery system have other sources, although those also have been hard-hit by the drought. The announcement affects water deliveries planned to begin this spring, and the allotment could increase if weather patterns change and send more storms into the state. Nevertheless, Friday's announcement puts an exclamation point on California's water shortage, which has been building during three years of below-normal rain and snow. "This is the most serious drought we've faced in modern times," said Felicia Marcus, chairwoman of the State Water Resources Control Board. "We need to conserve what little we have to use later in the year, or even in future years." State Department of Water Resources Director Mark Cowin said there simply is not enough water in the system to meet the needs of farmers, cities and the conservation efforts that are intended to save dwindling populations of salmon and other fish throughout Northern California. Friday's announcement came after Gov. Jerry Brown's official drought declaration in mid-January, a decision that cleared the way for state and federal agencies to coordinate efforts to preserve water and send it where it is needed most. The governor urged Californians to reduce their water use by 20 percent. It also reflects the severity of the dry conditions in the nation's most populous state. Officials say 2013 was the state's driest calendar year since records started being kept, and this year is heading in the same direction. A snow survey on Thursday in the Sierra Nevada, one of the state's key water sources, found the water content in the meager snowpack is just 12 percent of normal. Reservoirs are lower than they were at the same time in 1977, which is one of the two previous driest water years on record. The timing of Friday's historic announcement was important: State water officials typically announce they are raising the water allotment on Feb. 1, but this year's winter has been so dry they wanted to ensure they could keep the remaining water behind the dams. The announcement also will give farmers more time to determine what crops they will plant this year and in what quantities. Farmers and ranchers throughout the state already have felt the drought's impact, tearing out orchards, fallowing fields and trucking in alfalfa to feed cattle on withered range land. Without deliveries of surface water, farmers and other water users often turn to pumping from underground aquifers. The state has no role in regulating such pumping. "A zero allocation is catastrophic and woefully inadequate for Kern County residents, farms and businesses," Ted Page, president the Kern County Water Agency's board, said in a statement. "While many areas of the county will continue to rely on ground water to make up at least part of the difference, some areas have exhausted their supply." 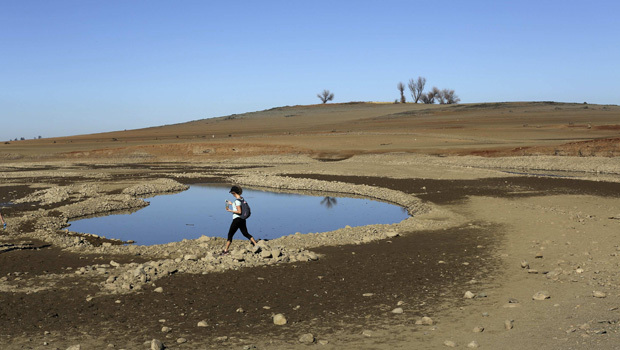 "The challenge is that in last drought we drew down groundwater resources and never allowed them to recover," said Heather Cooley, water program co-director for the Pacific Institute, a water policy think tank in Oakland. "We're seeing long term, ongoing declining groundwater levels, and that's a major problem." Meanwhile, the Colorado River, which feeds Nevada's Lake Mead, is drying up, meaning the lake is rapidly shrinking. The lake provides water for 20 million people in southern Nevada, southern California and Arizona - and it has lost 4 trillion gallons of water since 2000. Lake Mead is expected to drop at least another 20 feet this year, and that would devastate Las Vegas. Ninety percent of the area's water comes from the lake. Already, at least one of the two pipes sending water to the city could soon be above water. In response, Nevada is rushing to build a third pipe even deeper. "The rate at which our weather patterns are changing is so dramatic that our ability to adapt to it is really crippled," Pat Mulroy, the general manager of the Southern Nevada Water Authority, told CBS News. With other rivers in California reduced to a trickle, fish populations also are being affected. Eggs in salmon-spawning beds of the American River near Sacramento were sacrificed after upstream releases from Folsom Dam were severely cut back. The drought is highlighting the traditional tensions between groups that claim the state's limited water for their own priorities - farmers, city residents and conservationists. "This is not about picking between delta smelt and long-fin smelt and chinook salmon, and it's not about picking between fish and farms or people and the environment," he said. "It is about really hard decisions on a real-time basis where we may have to accept some impact now to avoid much greater impact later."